Carib Ocho Rios Condominium está situado junto al mar en un jardín tropical con vistas al hermoso mar Caribe. 'Caribes' se encuentra a poca distancia de la popular localidad turística de Ocho Ríos, con sus tiendas libres de impuestos, restaurantes, entretenimiento y atracciones turísticas. Es un desarrollo seguro, con seguridad las 24 horas y puerta de seguridad tripulado en la entrada. El condominio está ubicado en el segundo piso del edificio más cercano a la playa Mahogany. Este encantador condominio tiene una versión con aire acondicionado, un hermoso cuarto de baño con azulejos, sala de estar, comedor y una gran terraza con vistas al mar. La gran terraza tiene dos sillones con cojines y una mesa con sillas para comer al aire libre. Hay un ventilador de techo en el dormitorio, que es también de aire acondicionado, un ventilador de techo en la sala de estar .. Hay una cocina totalmente equipada que incluye microondas, licuadora, tostadora, etc. También TV por cable, conexión a Internet Wi-Fi. Incluido en el precio del alquiler son los servicios de nuestra maravillosa ama de llaves, que mantiene el apartamento muy limpio y cómodo ella poner en orden el apartamento tres veces a la semana durante su estancia excepto para estancias de larga duración (más de dos semanas). Preparación de la comida y las compras no se incluyen sin embargo usted puede hacer arreglos con el ama de llaves. Hay un servicio de lavandería que recoger y entregar. Un exuberante entorno tropical, maravillosa playa de aguas tranquilas, arrecifes cercanos son ideales para el buceo, deportes acuáticos; Alquiler de barcos y Gear, Playa Restaurante / Grill, Beach Bar. La búsqueda del tesoro, una pequeña sala de slot 'casino'. Área: Carib está a poca distancia de la ciudad turística de primer Ocho Ríos en Jamaica con muchas tiendas libres de impuestos y de los mercados a lo largo del camino. Hay varios bancos y Cambios para su conveniencia. Hay varios supermercados, restaurantes dentro de todos los rangos de precios dentro de un corto paseo a pie o en taxi. Ocho Ríos es también el hogar de muchas de las atracciones turísticas de Jamaica. Baño con azulejos con bañera / ducha y WC accesible para personas con discapacidad. I have stayed at several places in Jamaica but this was one of the lovliest. Very very clean and so cozy. Sandra the owner great with communicating. Beautiful ocean view.. The grounds are so pretty. Quiet. Fabulous air conditioner allowed such a nice sleep for July in JA ! Easy to get to town. Thank you & I will stay here again. Thanks for taking time to write such a wonderful review. It was a pleasure communicating with you prior to your stay. You were a wonderful guest and we look forward to your next visit. The condo is located in a tranquil gated community. The grounds are well maintained with lots of tropical plants and flowers, and to top it all off the condo has a beautiful view of the sea. 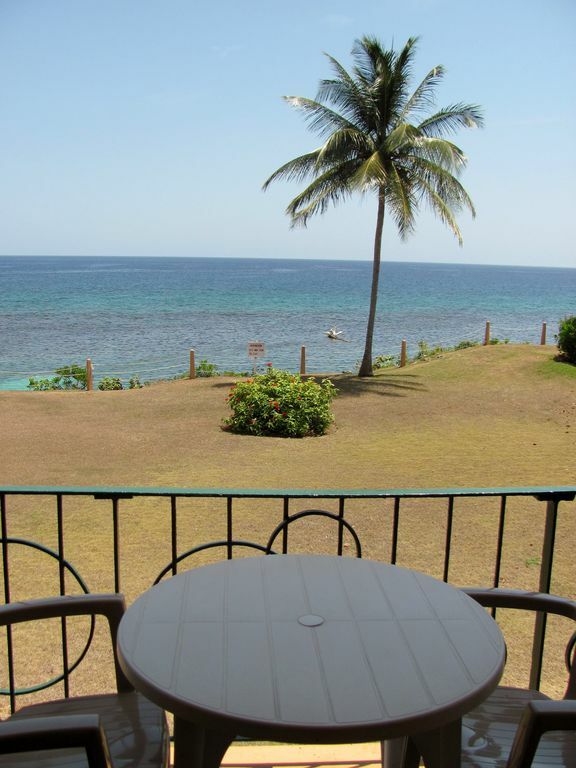 There is also a private beach a few steps away which is available for guest and owners. The condo itself was clean and spacious and has all the basic ammenities needed for a comfortable stay. The wi-fi was also fast and reliable. Getting to town was an easy walk or one can easily get a taxi for the equivalence of less than a dollar fifty (U.S). The owner, Sandra was very responsive and eager to ensure that everything was in place for my arrival. Dawn, the housekeeper was just wonderful and was always only a phone call away for questions or anything I needed. This is not a resort, simply a comfortable and beautiful location to stay while enjoying the attractions in Ocho Rios and the surrounding areas.I totally enjoyed my stay and now know where to find '"home" on any future trips to Ocho Rios. Dawn is a wonderful sweet property manager with a million dollar smile. She cooked a delicious meal for us and took care of every little need we had. We used Patrick as our driver the whole week. He was hilarious and so much fun. He watched over us and made sure we paid correctly and received the correct change whenever we made a purchase. Sandra the owner is as sweet and kind as can be. Excellent experience here!!! Was a nice place nice and close to the ocean. All the staff was friendly and outgoing. Place was a little outdated, but is was enough for our time period. Great view, great beach, comforts of home! I got much needed rest in a comfortable space and a magnificent view. The housekeeper Dawn is a jewel so pleasant. We had a wonderful holiday the accommodation is in a 1st class location within a short walk to the beach and a 5 minute walk to the town. Ocho Rios has lots of good restaurants and supermarkets. Ours favourite restaurants were Miss T's and the Almond Tree. The town is busy with a very lively market selling a wonderful verity of fruit and vegetables. We found the Jamaicans to be very friendly and helpful. The Condo was basic but perfectly adequate for our needs, the owner was very helpful and informative. The view from the balcony was wonderful and we woke to the sound of the sea every morning. We are keen snorkelers and found that the reef just off the beach to be very good, the cliff edge was our favourite place to snorkel with an abundance of fish, eels and much more. We also hired a boat for a few hours with a guide who took us to a lovely beach, reef and waterfall. Ocho Ríos es la ciudad turística más importante de Jamaica. "Ochie" tiene algo para todos los jóvenes, desde el animado Margaritaville hasta las aguas frescas de Dunn's River Falls y la emoción de Dolphin Cove donde puedes nadar con los delfines o simplemente relajarte en la playa. Rates are for up to 2 people, there is an additional fee for each additional adult (18 and over). Housekeeping provided three times a week during your stay, this does not apply to long term rentals (over two weeks) We provide a land line Pre Paid telephone and put free credit on the phone for our guests convenience to make local calls, long distance calls to Kingston, etc will use up the credits very quickly. Should this credit run out ask the housekeeper for credit (within reason). for to long term rentals (over two weeks) we will provide only initial credit on the phone.